It may be hard to believe, but some of the best jobs in the legal marijuana industry aren’t in cultivation or sales. While these may be the most familiar cannabis careers, there are a surprising number of creative marijuana jobs out there for artists, designers and writers to take advantage of. Marijuana has always been associated with arts and music, with strong roots in the Harlem Renaissance and counterculture pacifism in the 1960s and 70s. Now, in the 21st century, creative marijuana jobs offer candidates the opportunity to make a living in the developing cannabusiness. Graphic designers know that any booming industry requires their services to help businesses make their brand a more distinct presence. Marijuana graphic design jobs have followed the marijuana industry from black market biz to the medically grey market and now a new wave of the green rush. Designers bridge the gap between the creative arts and advertising, helping to position cannabis in a context that lauds its medically efficacy and taxable revenue potential. 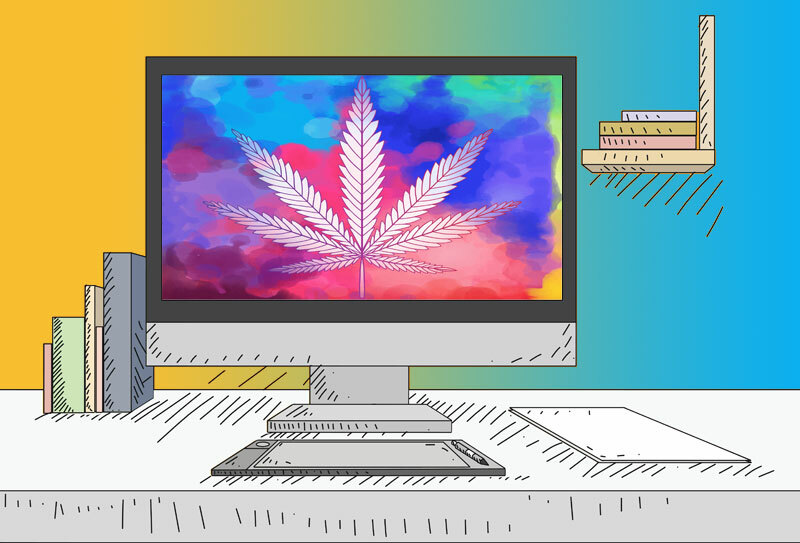 Motion design and infographics have been particularly beneficial to the legal cannabis industry by creating user-friendly informational guides. It’s thanks to infographics that many previously uninformed individuals first learned the difference between indica and sativa. Graphic designers work closely with cannabis dispensaries, edibles companies, marketing firms and more to best prepare the industry for the ups and downs of mainstream coverage and popularity. Cannabis culture is having a moment and nowhere is that more evident than in fashion. everything from socks and silkscreen tees to high fashion apparel are getting the green treatment. Recently, designer Alexander Wang released his 2016 SS campaign. The fashion maverick thrilled stylish stoners around the country with its detailed designs of cannabis flowers. Other major brands like HUF have reached iconic status with their simple high socks emblazoned with fan leaves. It doesn’t seem like the movement to express cannabis love and activism through clothing is going to end any time soon. The importance of cannabis paraphernalia cannot be overstated. Every cannabis consumer has a preferred method of consumption from smoking joints, to vaping, or consuming edibles. Paraphernalia designers and glass blowers use their artistic skills to create durable and gorgeously inspired bongs, pipes and rigs. Gone are the days of cheap pipes, industry leading glass artists have hopped on the cannabis bandwagon and made a killing by selling their wares at music and cannabis festivals and online. Some artists charge hundreds, even thousands of dollars for single pieces and make big commissions, while others are skilled at churning beautiful, less expensive designs for the average consumer. You could spend all day searching through catalogues of different cannabis strains in hopes of finding one to fit your bill, but that’s what cannabis critics are for! Cannabis criticism jobs have exploded in popularity after major newspapers The Denver Post and The Oregonian published ads for contributing strain reviewers. When the legal business broke in Colorado in 2014, online and print publications saw the potential for increasing readership by including regular pieces supporting the cannabusiness and its consumers. Working as a cannabis critic may not be a full-time job, but it is one of the best creative marijuana jobs and allows for writers to share their personal opinions and educate readers on the effects, taste and health benefits of cannabis products.As the industry has expanded, so has the coverage of cannabis critics. In addition to flower strains, critics review a wide variety of concentrates, edibles, topicals, tinctures, paraphernalia, novelties and more! Essentially, the cannabis critic has gone from being an experiment to a necessary addition to many publications, across the board. Cannabis criticism is also one of the best marijuana jobs for introverts, as it involves primarily solitary work. Photographers and videographers are in demand across the cannabusiness. Everything from advertising agencies to weed-centric publications and television programs benefit from the artistic and informational potential of cannabis imagery. Photographers, like graphic designers, maintain significant influence in the industry. The way they compose an image plays a surprisingly large role in how cannabis is perceived. Depending on whether photographers support or disagree with cannabis use can be starkly reflected in a photo through the use of various angles, lighting, exposure and post-processing. Therefore, marijuana photography jobs are important in moving the cannabiz forward with less stigma. In recent years, Youtube has been a major platform for distributing cannabis information and tutorials throughout the world. Videographers capture, edit and disseminate videos that have the capacity to reach an audience much more vast than ever before. The Hollywood film and television industry is even starting to embrace cannabis, knowing its potential for boosting ticket sales. This sort of traction has the ability to employ more videographers and contribute to creative marijuana jobs. If you thought some of the creative marijuana jobs were outside the box, just wait until you hear about cannabis joint artists. These creative stoners make a living by wrapping cannabis flower in elaborate sculpture-like joints and subsequently sharing their creations on social media and entering them into joint art competitions. Yes, there are competitions. Joint artists make a living through their winnings, as well as direct client sales. Think of it like a cake artist or decorator. One artist says he’ll essentially roll specific joints for anyone who hits him up on social media and can pay for it. Especially now that sites like Instagram are being used as platforms for businesses, creative marijuana jobs have firmer ground to stand on. Joint art can take forms as “simple” as a mushroom or a flower, or elaborate as a half-pound AK-47 and full size pot pizzas. Cannabis dispensaries haven’t always pushed the envelope when it comes to interior design, decoration and layout. Even in the current market, many dispensaries are no frills establishments with a spacious sales floor and minimal decorative intention. Some pot shops, however, are seizing the opportunity to elevate themselves above the competition by creating a unique design and atmosphere. Interior designers and decorators harness different facets of cannabis culture and use it to their advantage in selling products. While some stores play on the earthy, somewhat new-agey appeal of cannabis, others focus on its influence in counter culture, the arts and music. There are many different aspects of the industry to incorporate that position each business as unique from the next. Many new dispensaries have chosen to go the ultra-modern approach that some third-wave coffee shops have explored in recent years. This tactic hopes to give credibility and style to the industry by stripping away all of the stereotypical cannabis themes and letting the product speak solely for itself. The legal cannabusiness is proving to be very exciting for artists with the influx of creative marijuana jobs proliferating in different cannabis hotspots around the country. This industry has the potential to give creatives a chance to earn a livable income with their art and creative skills, rather than putting in a lot of work for little pay. This is why so many individuals are transitioning into niche creative marijuana jobs, where they can hone their skills for a select group.